As far as I’m concerned, there’s no one on the planet who can teach us more about aging bones than R. Keith McCormick, DC. McCormick is a certified chiropractic sports physician, former varsity cross-country runner at Stanford University, and a former member of the U.S. Olympic Team. One day, while running a track workout, he became suddenly lame with hip pain. Several MRIs and X-rays later, he was diagnosed with severe osteoporosis—at the ripe old age of 45. “Wow, you have worse bone density than a 100-year-old woman,” blurted the X-ray technician who evaluated McCormick’s films. McCormick’s diagnosis led him to study osteoporosis with the passion of someone who has a horse in the race. And what he discovered has a great deal to teach us—not only about osteoporosis, but also about aging, longevity, and the interconnectedness of everything in the body. Indeed. And a quick explanation of what goes wrong when bones weaken will illustrate exactly what he means. The large cast of characters in the drama of bone-building makes the New York City phone book look like a grocery list, but two of these characters deserve special attention. The osteoblasts are the cells that form what’s called the bone matrix, a honeycomb-like structure onto which minerals such as calcium are deposited (or absorbed), resulting in nice, hard, firm “mineralized” bones. But this is not a one-way street. While minerals continue to be deposited on that honeycomb, other cells—osteoclasts—are busy removing minerals in a process called resorption. The delicate balance between adding and subtracting, between mineralization (building up) and demineralization (breaking down), between absorption and resorption is called, appropriately enough, remodeling. It’s actually very much like what happens when you remodel your bathroom. Workers remove debris (old, broken tiles) while other workers bring in fresh material(new tiles) and cement them down on the floor (the honeycomb, or bone matrix). The osteoclast workers remove debris, while their osteoblast partners begin the process of setting in new tile. The way the two types of cells, osteoblasts and osteoclasts, communicate is through a molecule called RANKL. This molecule allows the workers bringing in the new stuff to coordinate with the workers removing the debris. When the osteoblasts release RANKL, it tells the osteoclasts to take out just the right amount of trash. A perfect system, right? It is, until inflammation enters the picture. When you have chronic inflammation, your immune system is working overtime. One of the first things the immune system does when it’s activated is release T cells, those sentries of immunity that are summoned whenever the body senses an injury (such as inflammation). Guess what the T cells do? They produce RANKL. This tells the osteoclasts to keep on removing minerals, significantly weakening your bones. Other players in the bone-destruction game are the stress hormone cortisol (which leads to an imbalance between mineralization and demineralization), and oxidative damage from free radicals (which overstimulate the cells that tear down bone). This is why antioxidants are a big part of McCormick’s recommendation for keeping bones strong. McCormick is a particular fan of a powerful antioxidant known as NAC (N-acetyl-cysteine) because it specifically lowers reactive oxygen species within the osteoclasts themselves. “Every woman should be on 600 to 1,200 milligrams a day of NAC,” he told me, “especially after menopause.” (One of the things estrogen does is help reduce bone resorption; without it there to do its job, you need even more help keeping the osteoclasts from getting too busy!) McCormick thinks NAC is a good idea for men as well. He also recommends a blood test for vitamin D, which helps ensure that the body absorbs calcium. Without adequate vitamin D, you can take all the calcium in the world and it won’t do you much good. Research shows that more than 70 percent of women ages 51 to 70 and nearly 90 percent of women over 70 are not getting enough vitamin D from food and supplements. Low levels of vitamin D are associated with reduced calcium absorption, bone loss, and increased risk of fracture. 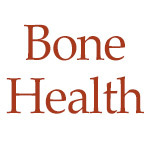 When it comes to bone health, it’s particularly important to avoid what we call the bone robbers. “If you want good bones, you have to limit your alcohol intake, stop smoking, not salt your food excessively, go easy on the sugar, and not consume soda,” McCormick says. Sodas in particular are loaded with phosphoric acid, a known robber of calcium. Calcium: 1,000 to 1,200 milligrams daily. Magnesium: 500 to 600 milligrams daily. Vitamin D3: 1,000 to 2,000 international units daily. Vitamin K: 1 milligram or more daily. selenium. Other helpful antioxidants include curcumin (found in turmeric), and NAC. Fish oil: 2 to 3 grams a day (try Barlean’s Double Potency Ultra EPA-DHA). Flaxseed meal (try Barlean’s Forti-Flax): 2 to 4 tablespoons daily. Probiotics: 3 million to 20 million viable cells/daily. Silicon: 10 milligrams daily; use the ch-OSA form (try BioSil). Add to this list FlexNow, a new supplement on the market. It’s an extract of shea nut oil, which has been found to significantly reduce joint pain. I now recommend it to anyone interested in keeping joints healthy. Remember, weight-bearing exercise is one of the best ways toprotect bones, but you can’t exercise if you’re in pain. [Editor’s note: See 'Check Out' for information on joint health.